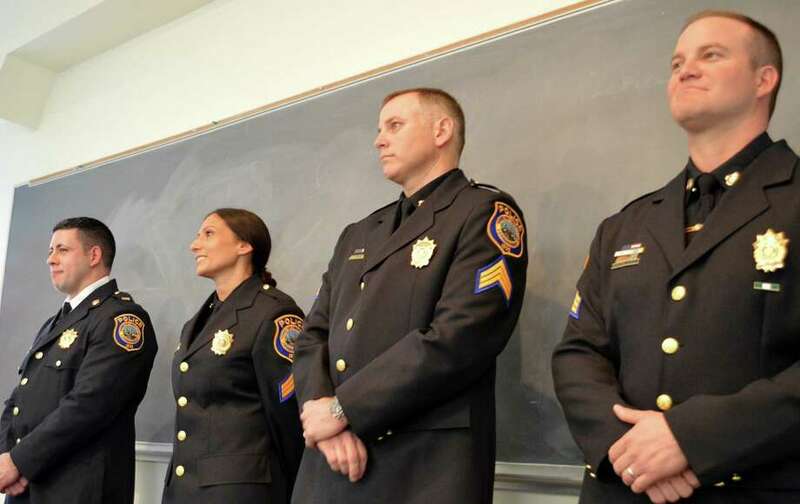 Four police officers were promoted in rank Friday afternoon including, from left (with their new rank), Lt. Anthony Prezioso, Sgt. Sereniti Dobson, Sgt. Richard Bagley and Sgt. Robert Myer. Four police officers were promoted last Friday at a ceremony that honored their commitment to protect and serve the residents of Westport. Sgt. Anthony Prezioso was promoted to lieutenant, while acting Sgt. Robert Myer, Detective Sereniti Dobson and Corp. Richard Bagley were all promoted to the rank of sergeant. “All of you that are our police officers contribute greatly to the quality of life in Westport,” First Selectman Jim Marpe said, noting that while there may be an occasional complaint, he hears many compliments about the department and its personnel. Prezioso, a 10-year veteran of the town’s police force, currently serves as a supervisor in the Detective Bureau. He is a 1998 graduate of Notre Dame High School in Fairfield and a 2002 graduate with honors from Fairfield University, where he earned a bachelor of science degree in marketing. Myer, a Westport native with 23 years of experience, currently serves as team commander for the Westport Police/Fire Dive Rescue Team and a negotiator with the Southwest Regional Emergency Response Team. He is a graduate of Staples High School and received a bachelor’s degree in criminal justice from Sacred Heart University. Dobson, another 10-year veteran, serves as the department’s youth officer, as well as a member of the Governor’s Task Force on Justice for Abused Children. She has received an associate’s degree in criminal justice from Norwalk Community College and a bachelor’s degree in criminal justice from the University of New Haven. Bagley, who also has 10 years in the department, holds a master’s degree in administration of justice from Salve Regina University, and serves as a field training officer. “I have every confidence that you will answer the calling that brought you into this profession,” he said.